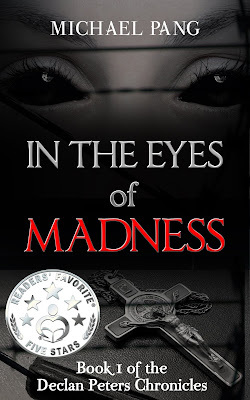 I would like to thank you for allowing me to share a little about my young adult paranormal fiction novel, IN THE EYES OF MADNESS of the DECLAN PETERS CHRONICLES series, and myself. Let me start off saying that I’m a huge fan of the paranormal and urban fantasy genre. I feel that I already spend most of my day in the real world (going to work, playing and taking care of my kids, and spending time with my wife). When I open a book, I want to dive into a world that is magical, where anything can happen. So, one might ask, well, why not just pure fantasy novels? Fantasy novels tend to build amazing magical worlds that can allow the reader’s imagination to completely run free. I would agree with that. And I do enjoy a fantasy novel every so often for that reason. However, urban fantasy has the ability to cause a paradigm shift from how we would view our everyday life. They like to twist the things that would seem mundane into things that really make you wonder. And when you then add the paranormal theme to these urban fantasies what you end up with is a masterpiece that drills down the dark forbidden paths that you would avoid in real life. These stories tantalize your curiosity, fear, excitement, and bewilderment all at the same time. I guess I would say that the idea of my novel came to me in a somewhat mystical way. About four years ago, my wife and I had our first baby. Months of sleepless nights went by and we both looked like zombies. Then, one night a very strange dream (more like a nightmare) came to me about a teenager working in a mental asylum. The patients there were all gaunt and ghastly with very abrupt demeanor changes. Some of the things the patients were doing were fairly odd and supernatural (like levitating, retrieving objects via telekinesis, and speaking with multi-vocal projections). And I remember wandering to myself, are these people all just insane or demon possessed. Then the teenager went into a room and called the patient residing in the room, “mom.” She turned around abruptly, and the expression on her face was terrifying as she pounced on him. I woke up immediately. As shaken from the dream as I was, I couldn’t help wanting to find out what happened to the teenager. I tried to go back to sleep in hopes of getting the dream to continue. But it didn’t work. The next morning, I told my wife about the strange dream and how I had hoped that it had continued when I went back to sleep. So my wife told me that it sounded like it would make an excellent novel and that I should write my own ending. And over the past four years, I’ve been working hard (writing and re-writing) this story. It’s funny how things tend to fall into place. When I started writing the story, my role within the energy company that I was working at the time for had changed. And I ended up traveling almost every month. There were just so many movies that you can watch on the plane before you get extremely bored, so I continued my writing while I was on the plane and at the airports during a layover. 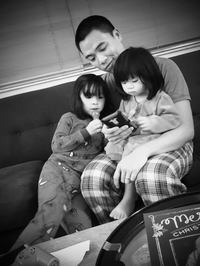 Were I at home, I think I would have spent the time with my wife and kids instead. And now, four years later, I published my 222-page novel, IN THE EYES OF MADNESS, with Sola Fide Publishing. IN THE EYES OF MADNESS is volume one of the DECLAN PETERS CHRONICLES series. You can expect to dive into a magical world that mirrors our own. Explore hidden secrets behind the heroes and the villains that are sure to keep your minds wondering. I like the book cover and summary! Declan sounds like a good character!